Have a sweet tooth? If you love nuts and cinnamon, try this treat! It’s quick, easy and delicious. But before we dive into the recipe I wanted to talk a little bit about nuts/seeds. Nuts and seeds are highly nourishing. They are very rich sources of vital minerals, amino acids and fats. Unfortunately, Delicate Bellies usually find it difficult to digest them since they contains enzyme inhibitors, phytic acid and other substances to protect them so they can become a plant. If you read my article “What is a Delicate Belly? – How Gut Dysbiosis is impacting nearly everyone and they don’t even know it”, you probably remember that. So it’s important to properly prepare them in order for them to be consumed. Feel free to substitute the cashews for almonds, pecans or walnuts. For this recipe I use raw cashews that have been soaked in salt water for 3 hours and dehydrated for 8-12 hours. I also use organic grade B maple syrup for its higher nutrient content. 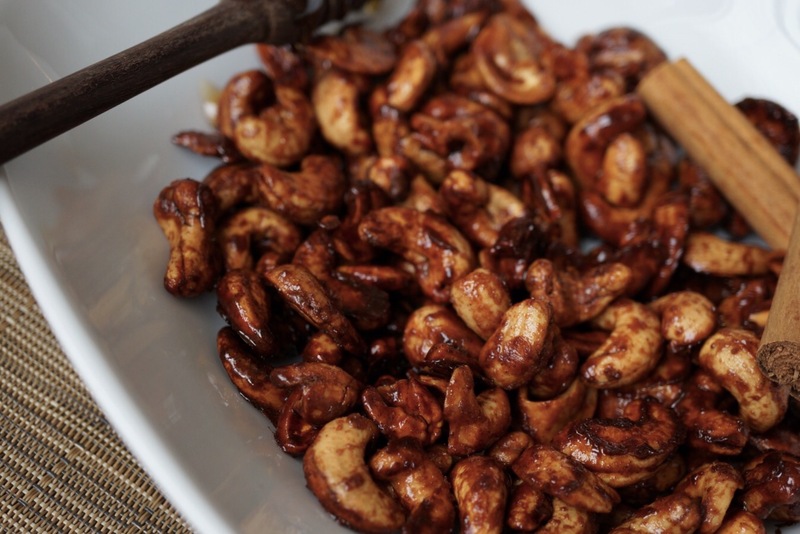 Spread cashews on a parchment-lined baking sheet. Bake them for 15 minutes or until toasted. Make sure to stir them often for even cooking. Remove them from the oven (you will notice they are still sticky but will harden as they cool).